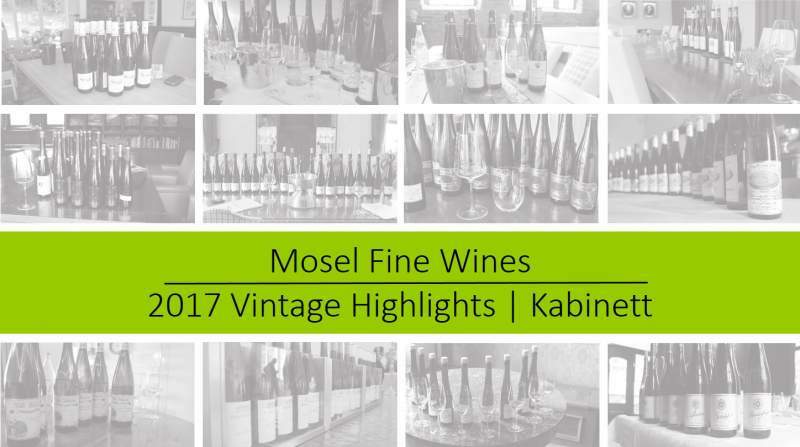 We look back at Kabinett in the 2017 vintage and share our list of not-to-be-missed vintage highlights. The low yields in 2017 made for quite intense wines. Truth must be told, 2017 is not a vintage for feather-light Kabinett: The vintage was simply too ripe or intense for that. At their best, the 2017 wines bottled at Kabinett have the intensity of a Spätlese paired with the raciness of Kabinett, a winning combination for lovers of beautiful wines with racy elegance. At the top, Weingut Julian Haart (who produced the Kabinett of the vintage), Weingut von Hövel, Weingut Peter Lauer, Weingut Egon Müller, Weingut Willi Schaefer and Weingut von Schubert - Maximin Grünhaus produced some stunning wines. Also Hofgut Falkenstein, Weingut Schloss Lieser, Weingut von Othegraven, Weingut Max Ferd. Richter, Weingut Daniel Vollenweider and Weingut Weiser-Künstler confirmed their status as leading producers of Kabinett-styled wines. Overall, Weingut Julian Haart, Weingut Peter Lauer, and Weingut von Othegraven underlined their savoir-faire by landing each three or more wines in our list of Kabinett highlights. Two up-and-coming growers joined this elite club in 2017, Weingut Stefan Müller (with immediately TWO wines) and Weingut Später-Veit. These two Estates proved hugely impressive overall and are already now among the finest of the region. We cannot review Kabinett without addressing the topic of declassification. 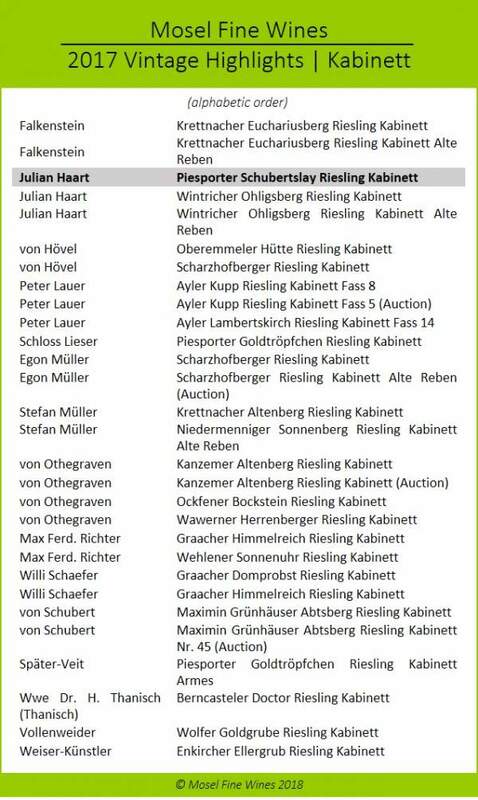 Some growers bottled big creamy-sweet wines as Kabinett. Such wines may offer terrific value as cheaply priced Auslese. However, we see this as a misguided approach as customers, will not get the style of wine stated on the label. As it concerns quite a few wines, we urge our readers to carefully read our tasting notes before buying into 2017 Kabinett. We provide here the Kabinett highlights from the 2017 vintage (for number lovers: potentially 93 pts or more at maturity). 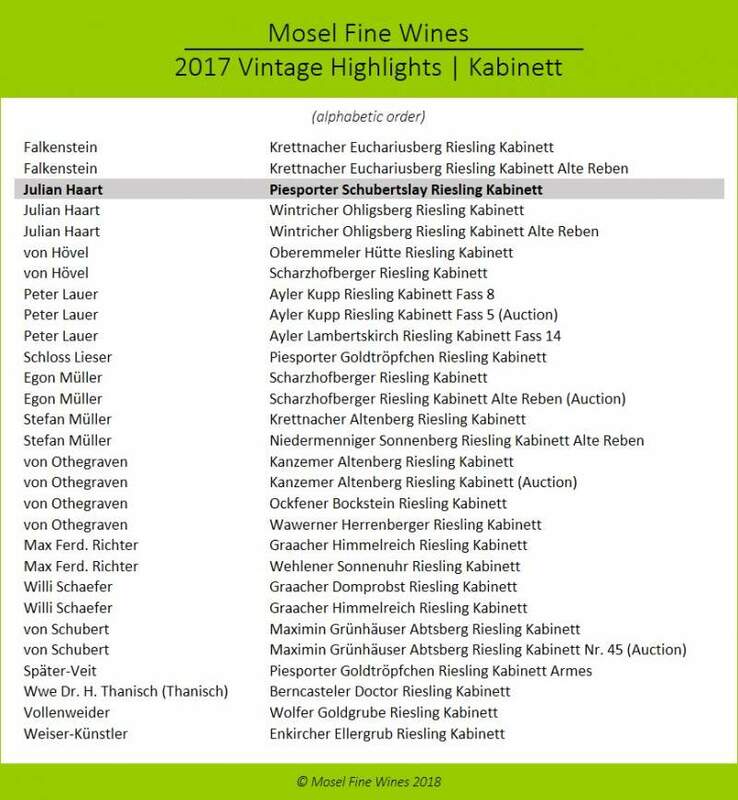 Our detailed reports on the 2017 vintage (Issue No 41, Issue No 42, and Issue No 43) will help you to navigate through the offers of Kabinett on the market as they provide detailed tasting notes for over 1,000 recommended wines from over 100 different Estates.